Harris Boats and Bart’s Water Sports are celebrating the arrival of summer with weekly prize giveaways to make your pontooning experiences even more memorable. The promotion is being run through the Harris Boats Facebook page, so anyone with a Facebook account is eligible to enter the giveaway. 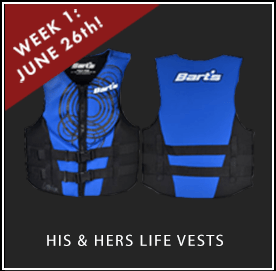 The first prize drawing is for Bart's Water Sports his and her life jackets so enter your name to win. Drawings will be held each Friday, from June 26 to Aug. 28, for quality prizes from Bart’s Water Sports. Among the items up for grabs are life vests, towable tubes, a kneeboard and more. It takes just one entry to be eligible to win any of the ten prizes. After you enter, share the contest with family and friends for additional chances to win. For every entry generated from your share, you’ll get another chance to win!